Who goes to the Chiropractor? Was GMA’s Neck Surgery Necessary? Is it really a dreaded word to hear from the doctor that you or your child has scoliosis? What is the cause and what is the cure? There are visions of the Hunch back of Notre Dame from in the movies and yet there doesn’t seem to be much of an explanation of why and what can be done. The typical are general stretches or exercises if mild and wearing a back brace in more advanced cases; then there is that word “surgery” that might be mentioned. Chiropractic does not view scoliosis as a medical disease or a condition that needs to be attacked with a remedy or a brace or a set of exercises or even surgery. As non-surgical spinal experts, chiropractors look at the spine as a dynamic structure that adapts to less than ideal architectural conditions. Yes, we think most people have a straight spine… right? But this is not true. Idiopathic scoliosis is found in 8% of Western populations and closer to 12% in Asian countries. A small (very small) percentage of scoliosis cases do require surgery to avoid secondary complications to one’s health as vital organs are at risk of being compressed by the bending, almost contortion like twists of the spine. Most everyone else will benefit from an expert conservative spinal expert opinion as the causes of scoliosis is a physical one, so there is no drug therapy that applies. Intra-uterine pressures, traumatic birth experiences, early life minor or more severe falls or injuries and even the more remote congenital or inborn factors produce joint surfaces in the lower lumbo-pelvic spine that are uneven (asymmetrical) and form the basis for spinal curvatures. Some scoliosis cases can be improved and others to a lesser degree. 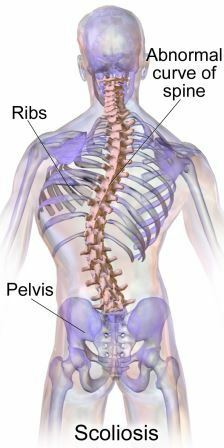 In either case the object of chiropractic care when scoliosis is present is the same for non-scoliotic conditions… restoring optimal spinal function and improve the architectural influences that favor a life with less negative neurological outcomes. Scoliosis merely increases spinal stress so a chiropractic evaluation is wise. In other words, although scoliosis may complicate spinal care and some correction is hoped for, but eliminating spinal mis-alignments from a child’s life (adults too) will favor greater health, less disease, less pain or disability, better posture and where practical healthy lifestyles are encouraged. Scoliosis is a concern and may be a factor complicating spinal health care, but it is certainly not a disease to be dreaded. Looking to set an appointment with us? Visit our NEW PATIENT CENTER and learn how you can get an online pre-payment “20% First Visit Discount”. Alternatively, you can call our patient hotlines at 88-CHIRO. Mabuhay! And Welcome to a Better, Healthier Lifestyle!